As part of the APA's aim to empower you, the consumer , by giving you the facts you need to make informed decisions, we've published The Complete Canadian Used Car Guide 2003. Written by APA president George Iny and the APA staff, we've brought all our expertise on automobiles together into one book, 600-plus pages packed with up-to-date and detailed information on buying, owning, and selling a used vehicle. Find clear and current information on used cars of all makes and models, minivans, and compact and mid-size SUVs. Lively, authoritative and comprehensive, The Complete Canadian Used Car Guide is the definitive reference to help you choose the vehicle that fits your needs and budget. 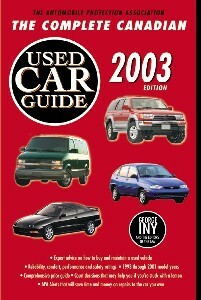 Buying the book: We encourage you to buy The Complete Canadian Used Car Guide at your local independent bookstore. It can also be ordered online through Amazon.ca and Chapters.Indigo.ca. The Civic-based CR-V is in many ways an extension of Honda’s classic Civic Wagon of 1984, which was also available with Honda’s Real-Time four-wheel-drive. TheCR-V was largely unchanged until a new model was introduced in 2002. The CR-V is not based on a truck chassis like some of the smaller sport-utility vehicles, but uses the monocoque platform of a Honda Civic. At introduction in 1997, the CR-V’s 2.0L in-line four-cylinder engine developed 126 horsepower and sent its power to the wheels via a four-speed automatic transmission. As with the Real-Time four-wheel-drive system in the Civic of the 1980s, the CR-V’s power is sent through the front wheels unless they detect slippage, when power is sent to the rear wheels as well. In 1998 the automatic transmission was joined by a five-speed manual gearbox, and in 1999 horsepower jumped from 126 to 146. The CR-V is a clean-lined vehicle that looks modern and tidy. Its size neatly plugs the gap between the “Sport-Cutes?like the Toyota RAV4 and near-leviathans like the Ford Explorer. Unit construction obviates the need for a separate frame and allows the CR-V to have both good ground-clearance and a reasonable step-in height. The interior of the CR-V is roomy for its size, and you sit high up on large, comfortable seats front and rear. The interior styling and ergonomics are both fine and the interior is well presented. In the automatic CR-V the steering-column-mounted shift lever leaves the space between the seats clear. The CR-V’s spare tire is carried on its tailgate, which allows the ample cargo hold to be free of obstructions but requires swinging it away when you open the tailgate. There is a folding picnic table under the load bed, as well as a watertight compartment for the storage of fish or wet sports gear. The tailgate is one of the few areas where the CR-V can be criticized; it eschews the regular flip-up hatchback design for a less convenient arrangement with a flip-up rear window and a side-hinged tailgate that swings out like a regular door. As is usual for Honda, the CR-V is carefully assembled of quality components inside and out, and it’s rattle-free. Given that the CR-V is essentially a wagon on stilts, it is not surprising that it drives very much like a small minivan. Steering, handling and ride are all to reasonably high standards, and the CR-V is a pleasant vehicle to spend time in. Performance in the city with just the driver aboard borders on sprightly, but a fully loaded CR-V trying to maintain speed up a mountain needs a heavy foot on the accelerator. The extra 20 horsepower added to the 2.0L engine in 1999 were welcome. Though it is not the quickest vehicle around, it is reasonably refined, with a smooth-running four that does not begin to sound rough until it’s spinning faster than 4000 rpm - which it seldom does, even in fast cruising. Despite the tall upright body, wind noise is acceptable, and road noise is much better suppressed than in the RAV4 and Suzuki four-wheel-drives. The CR-V is a front-wheel-drive vehicle most of the time, but if the front wheels detect a loss of traction, the truck’s computer instructs the CR-V to send power to the rear wheels as well. This transfer of power requires no input by the driver and is totally seamless in operation. However, the system is slow to respond and was judged inferior to the RAV4 and part-time four-wheel-drive of the Suzuki in APA winter testing. While not able to navigate raging creeks and mountain tracks like some sport-utes, the CR-V provides what most people want - a tall wagon with a semi-rugged appearance and good winter traction. It avoids the poor driving dynamics, cramped quarters and poor gas mileage of many truck-based sport-utes. Resale values are strong; a used CR-V is easy to sell in urban markets because used-car buyers have recognized its virtues. Many used CR-Vs are four-year-old models coming off leases that belong to owners who want to make a little profit over the residual by arranging a private sale. Reliability: Above average. The mechanical components shared with other Honda products have been reliable. The plastic in the lower front bumper cracks easily in minor impacts. What to check: Front rotors (warped), sway bar links (broken). Safety: The CR-V has had dual airbags and ABS as standard equipment since inception. The 1999 CR-V received four- and five-star collision protection ratings for the driver and front passenger respectively in frontal impact and a five-star rating for all outboard passengers in a side impact when crash tested by the NHTSA. Recall covering 1996 model: the insulation on some under-dash wiring could wear and cause a short-circuit leading to the loss of some essential components like the windshield wipers, headlights, signals, etc. Inspect and repair, and install a protector tube on the wiring harness.